Popeye was right when it came to the health benefits of spinach, but that simple sailor man couldn’t have predicted this unorthodox use of the superfood. Researchers at MIT have found a way to use spinach to detect explosive materials in soil, potentially making the plant a safe way to detect landmines. Research on plant nanobionics, where plants are ‘upgraded’ with nanoparticles to give then new and unique capabilities, is a burgeoning field of study—but one that’s yielding fascinating applications. In this research, the leaves of spinach plants were embedded with carbon nanotubes that emit a distinct fluorescent when explosive chemical compounds called nitroaromatics are present. Probing large areas of land for hidden landmines is a tedious and dangerous endeavor, but what if you could simply plant carbon nanotube-enhanced spinach crops to serve as natural detectors? The plants draw moisture from the soil up into their leaves where it reaches those embedded nanotubes. Deciphering what the spinach plants detect in the soil does require some additional equipment, however. 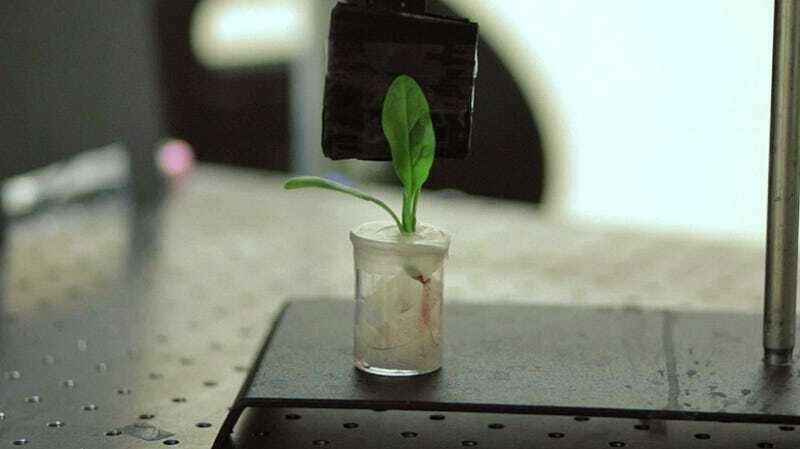 First, a laser light source is directed towards the plants’ leaves, which gets reflected by the embedded microscopic nanotubes. But those reflections aren’t visible to the naked eye. Instead, they require an infrared camera to be detected, which then allows the researchers to spot distinct flashing patterns revealing the presence of explosive compounds, and potentially, buried landmines. The researchers at MIT went one step further to connect a compact Raspberry Pi computer to the infrared camera so that when the chemical compounds they were hunting for were detected, it would automatically send out an alert. Since it takes about ten minutes for a spinach plant to absorb water from the earth, and even longer to grow from seeds, this approach isn’t the fastest way to clear explosive hazards. But the research serves as another example of the potential of nanobionics to turn plants into more than food and shelter. Are carbon nanotubes the future of everything?